Home › Forums › Theme Support › Dokan › Order placed then what? I see that the order in my dashboard says pending. how do I change it from pending to completed from the seller side? I went to DASHBOARD–>ORDERS–>VIEW and there is no button to change it. 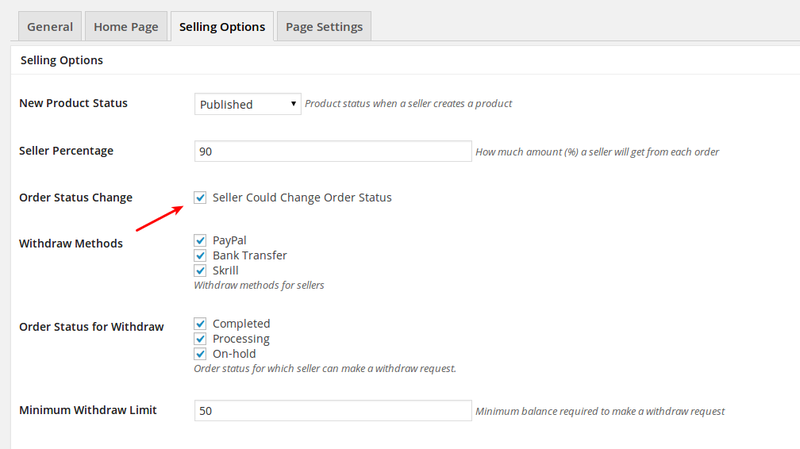 your documentation shows the edit button on the orders section and the order itself. I am missing those and not sure if others are with a recent update. see below. I was sent the subscription plugin to test it out for you earlier and it caused some issues but I uninstalled it. I am not sure if that has anything to do with it but I would like to get the site back to working again. Hello jay, What Browser you are using? In case of firefox, Press ctrl + Shift + K , It will trigger the Web Console. Or in chrome do the same and Move to the Console Section. And Provide us a Screenshot of the Console. We would like to know, if its happening because of something missing. N.B: If you uninstalled the Subscriber Plugin beta, Then it shouldn't be a problem anymore. it is too long to provide a screenshot. what is your email and I will send you the information. Okey, So it looks like nothing is missing from the page. Before We go deeper, Can you confirm that you checked the “order Status Change” Option from Dokan Settings? Go to dokan -> Settings -> Selling Option And you should find a Settings called, ‘Order Status Change'. Check that and save it. It should work. For your better understanding, Here is a Screenshot of that. Please take a Look. The topic ‘Order placed then what?’ is closed to new replies.